"friday-lunch-club": "The Politics of Fear"
The debate in the blogosphere however is quite funny: In defense of the New Yorker cover, people argue: shouldn't readers of the New Yorker be "sophisticated" enough to understand the cover's intent? The question itself begs the response: even sophisticated people are bigoted (towards Islam) in America. And that's not what satire is about. It's not just about "getting it"; it should still provoke and/ or humor. 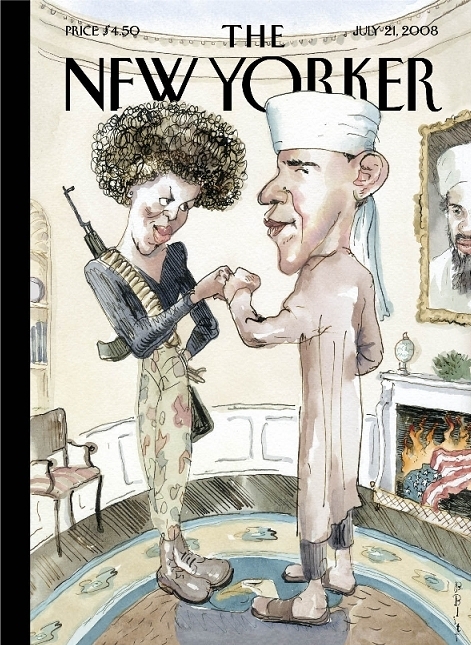 The cover fails to do either, except perhaps remind liberals that yes-- they are fearful of rumors that smear Obama as a secret Muslim and a radical hater of all things American. In and outside his campaign, supporters have been nothing but clumsy in trying to brush off allegations of an Islamic background. The real issue here that the Obama campaign has not dealt with the entire issue gracefully nor effectively. He has been as bigoted and hysterical in his rebuttal-- I was never a Muslim, God forbid! Remove those veiled women from the stage, etc. Bloedi also thinks that the Obama campaign shouldn't be so holier-than-thou and humorless, even if its a shabby, misguided effort at satirizing right-wing rumors. Reprimanding Bernie Mac and Wesley Clark was pathetic and cowardly. They just wish everyone would stay on message all the time and that Angie Merkel would grant BO a speech in front of the Brandenburg Gate. I'm opposed to that, unless presumptive German nominee for the Chancellorship Helmut von Affenarsch can do the same at the Lincoln Memorial.